I was tossing up dinner ideas for ages today and eventually chose to make this dish, from bills food by Bill Granger. It was very easy, very yummy and pretty healthy. Well, I made mine carbohydrate free, and instead of rice, took bok choy, which I stirfried with garlic and chilli. If it’s green it must be good for you, eh? Bill has about a million grilled / fried chicken recipes, which I am hoping to work my way through eventually. 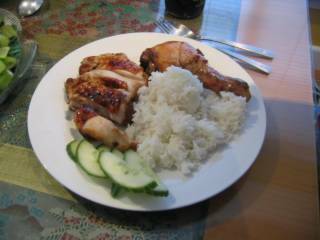 This one was yummy, tender and brown and reminiscent of my favourite Hong Kong BBQ meat – siew kai (roast chicken, duh!) , but less fatty and carby. For this dish, you take 1 chicken maryland per person, cut into 2 pieces between the drumstick and the thigh, marinate it in a soy-ginger-garlic-sake-honey-chilli mix and bake it in a moderate oven, basting every 15 minutes or so. Then you cleaver it up and have it with cucumber and rice (no rice for me)... I made my mum do the final stage of cleavering - I am so dangerously unwieldy with a cleaver! It was a struggle for me just to separate the drumstick from the thigh before cooking. My brother’s portion, which is why there’s rice! You see, my supposed post-Sydney detox has not been really very detoxifying lately, so I’m making a concerted effort from now until my birthday (6 weeks, wahoo!) to eat right. As least I’ve been exercising a lot. And with that, I’m off to the gym.